With the 3DS just weeks from a North American release, the DS (phat/lite/i/xl) is on its last legs. But, that doesn’t mean you should give up on it. Nope. As a matter of fact, think of it as a glorious opportunity to play that one game you heard great things about, but didn’t get, because it wasn’t Mario/Zelda/Pokemon/DragonQuest. So, in the spirit of celebrating the life of the soon-to-be deceased, each week — until the release of the 3DS — I will spotlight a great game that flew just under the radar. 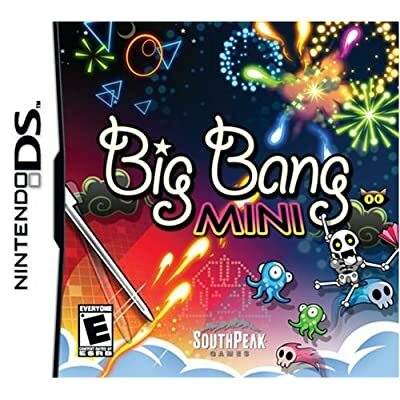 This week: Big Bang Mini. When describing Big Bang Mini, you run the risk of sounding as if you’re relaying the spontaneous events of a crazy Japanese game show. The game is a bottom-top shooter that has you doing more defensive play than offensive. In the game, you are triangle, no a snowball, no a ball bearing, no a radioactive square, actually all of them depending on the level, that is trying to avoid attack from above by paper dragons, golden frogs, frothy centipedes, and anything else your spastic mind can think of. As they drop bombs, you use the stylus to move your (we covered already) varying avatar out of harm’s way. However, you’re also tasked with defeating the attackers. To do this, you ALSO use the stylus to quickly slide up the screen (you strike your screen like you would a match) and launch fireworks at your assailants. Either a direct hit or fall-out from shrapnel will quickly do damage. Yes. You use the stylus to MOVE out of harm’s way while simultaneously using it to attack (no using of buttons in conjunction with the stylus). Sound frantic? It is; it gloriously, gratifyingly is frantic. 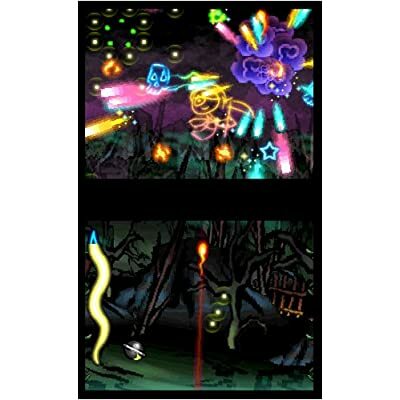 It forces you to really concentrate on placing your avatar in a protected spot on the screen, lob off a few shots, move your avatar, fire again, and repeat until the level is cleared. As you move through the game, you earn power-ups, which are your standard Arakanoid-type faire: freeze, rocket, bomb, burn, multi-shot, etc. But, it’s the art direction and non-stop action that sets this game far-and-above any other action shooter I’ve played on the DS in it’s 6+ year cycle. 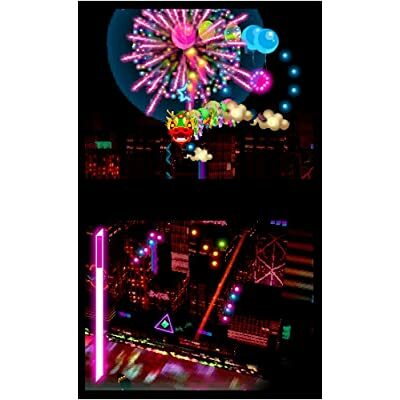 This is a must buy for anyone who found themselves enjoying Space Invaders Remixed, Arkanoid DS, or any other shmups on any console. Not every game I’ll be featuring will be the “best of” its genre; however, I can easily say this one is. It’s time to rectify your past mistakes in skipping this game (which can be forgiven, as it came out at roughly the same time as The Phantom Hourglass), and grab it. What’s more, you can grab it for a paltry $17 on Amazon. Can I view this on my iPhone? Because it doesn’t seem to be working. I don’t see the list from your direct link….help! BTW, Great presentation! It is a Prezi, which is flash-based, so it is not compatible with the iPhone…that is, unless you download the CloudBrowse app from the App Store (no jailbreak needed!). Enjoy!